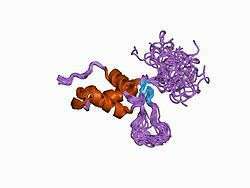 Forkhead box protein C2 (FOXC2) also known as forkhead-related protein FKHL14 (FKHL14), transcription factor FKH-14, or mesenchyme fork head protein 1 (MFH1) is a protein that in humans is encoded by the FOXC2 gene. FOXC2 is a member of the fork head box (FOX) family of transcription factors. d The protein is 501 amino acids in length. The gene has no introns; the single exon is approximately 1.5kb in size. FOX transcription factors are expressed during development and are associated with a number of cellular and developmental differentiation processes. FOXC2 is required during early development of the kidneys, including differentiation of podocytes and maturation of the glomerular basement membrane. It is also involved in the early development of the heart. An increased expression of FOXC2 in adipocytes can increase the amount of brown adipose tissue leading to lower weight and an increased sensitivity to insulin. FOXC2 is also involved in cancer metastases. In particular, expression of FOXC2 is induced when epithelial cells undergo an epithelial-mesenchymal transition (EMT) and become mesenchymal looking cells. EMT can be induced by a number of genes including Snail, Twist, Goosecoid, and TGF-beta 1. Overexpression of FOXC2 has been noted in subtypes of breast cancer which are highly metastatic. Suppression of FOXC2 expression using shRNA in a highly metastatic breast cancer model blocks their metastatic ability. ↑ Kaestner KH, Bleckmann SC, Monaghan AP, Schlöndorff J, Mincheva A, Lichter P, Schütz G (June 1996). "Clustered arrangement of winged helix genes fkh-6 and MFH-1: possible implications for mesoderm development". Development. 122 (6): 1751–8. PMID 8674414. 1 2 Miura N, Iida K, Kakinuma H, Yang XL, Sugiyama T (May 1997). "Isolation of the mouse (MFH-1) and human (FKHL 14) mesenchyme fork head-1 genes reveals conservation of their gene and protein structures". Genomics. 41 (3): 489–92. doi:10.1006/geno.1997.4695. PMID 9169153. ↑ Fang J, Dagenais SL, Erickson RP, Arlt MF, Glynn MW, Gorski JL, Seaver LH, Glover TW (Dec 2000). "Mutations in FOXC2 (MFH-1), a forkhead family transcription factor, are responsible for the hereditary lymphedema-distichiasis syndrome.". Am J Hum Genet. 67 (6): 1382–8. doi:10.1086/316915. PMC 1287915 . PMID 11078474. 1 2 Hader C, Marlier A, Cantley L (2010). "Mesenchymal-epithelial transition in epithelial response to injury: the role of Foxc2". Oncogene. 29 (7): 1031–40. doi:10.1038/onc.2009.397. PMC 2824778 . PMID 19935708. ↑ Lidell ME, Seifert EL, Westergren R, Heglind M, Gowing A, Sukonina V, Arani Z, Itkonen P, Wallin S, Westberg F, Fernandez-Rodriguez J, Laakso M, Nilsson T, Peng XR, Harper ME, Enerbäck S (Feb 2011). "The adipocyte-expressed forkhead transcription factor Foxc2 regulates metabolism through altered mitochondrial function.". Diabetes. 60 (2): 427–35. doi:10.2337/db10-0409. PMC 3028341 . PMID 21270254. ↑ Cederberg A, Gronning LM, Ahren B, Tasken K, Carlsson P, Enerback S (2001). "FOXC2 is a winged helix gene that counteracts obesity, hypertriglyceridemia, and diet-induced insulin resistance.". Cell. 106 (5): 563–73. doi:10.1016/s0092-8674(01)00474-3. PMID 11551504. ↑ Connell F, Brice G, Mortimer P (2008). "Phenotypic characterization of primary lymphedema". Ann. N. Y. Acad. Sci. 1131: 140–6. doi:10.1196/annals.1413.013. PMID 18519967. 1 2 Norrmén C, Ivanov KI, Cheng J, Zangger N, Delorenzi M, Jaquet M, Miura N, Puolakkainen P, Horsley V, Hu J, Augustin HG, Ylä-Herttuala S, Alitalo K, Petrova TV (May 2009). "FOXC2 controls formation and maturation of lymphatic collecting vessels through cooperation with NFATc1". J Cell Biol. 185 (3): 439–57. doi:10.1083/jcb.200901104. PMC 2700385 . PMID 19398761. ↑ Ng MY, Andrew T, Spector TD, Jeffery S (March 2005). "Linkage to the FOXC2 region of chromosome 16 for varicose veins in otherwise healthy, unselected sibling pairs". J. Med. Genet. 42 (3): 235–9. doi:10.1136/jmg.2004.024075. PMC 1736007 . PMID 15744037. ↑ Battula VL, Evans KW, Hollier BG, Shi Y, Marini FC, Ayyanan A, Wang RY, Brisken C, Guerra R, Andreeff M, Mani SA (June 2010). "Epithelial-Mesenchymal Transition-Derived Cells Exhibit Multi-Lineage Differentiation Potential Similar to Mesenchymal Stem Cells". Stem Cells. 28 (8): 1435–45. doi:10.1002/stem.467. PMC 3523728 . PMID 20572012. ↑ Mani SA, Yang J, Brooks M, Schwaninger G, Zhou A, Miura N, Kutok JL, Hartwell K, Richardson AL, Weinberg RA (June 2007). "Mesenchyme Forkhead 1 (FOXC2) plays a key role in metastasis and is associated with aggressive basal-like breast cancers". Proc. Natl. Acad. Sci. U.S.A. 104 (24): 10069–74. doi:10.1073/pnas.0703900104. PMC 1891217 . PMID 17537911. Fauret AL, Tuleja E, Jeunemaitre X, Vignes S (2010). "A novel missense mutation and two microrearrangements in the FOXC2 gene of three families with lymphedema-distichiasis syndrome.". Lymphology. 43 (1): 14–8. PMID 20552815. Witte MH, Erickson RP, Khalil M, et al. (2009). "Lymphedema-distichiasis syndrome without FOXC2 mutation: evidence for chromosome 16 duplication upstream of FOXC2.". Lymphology. 42 (4): 152–60. PMID 20218083.
de Mooij YM, van den Akker NM, Bekker MN, et al. (2009). "Abnormal Shh and FOXC2 expression correlates with aberrant lymphatic development in human fetuses with increased nuchal translucency.". Prenat. Diagn. 29 (9): 840–6. doi:10.1002/pd.2316. PMID 19548265. Sano H, Leboeuf JP, Novitskiy SV, et al. (2010). "The Foxc2 transcription factor regulates tumor angiogenesis.". Biochem. Biophys. Res. Commun. 392 (2): 201–6. doi:10.1016/j.bbrc.2010.01.015. PMC 2822046 . PMID 20060810. Vreeburg M, Heitink MV, Damstra RJ, et al. (2008). "Lymphedema-distichiasis syndrome: a distinct type of primary lymphedema caused by mutations in the FOXC2 gene.". Int. J. Dermatol. 47 Suppl 1: 52–5. doi:10.1111/j.1365-4632.2008.03962.x. PMID 18986489. Kume T (2008). "Foxc2 transcription factor: a newly described regulator of angiogenesis.". Trends Cardiovasc. Med. 18 (6): 224–8. doi:10.1016/j.tcm.2008.11.003. PMC 2674371 . PMID 19185813. Yoshida T, Kato K, Fujimaki T, et al. (2009). "Association of a polymorphism of the apolipoprotein E gene with chronic kidney disease in Japanese individuals with metabolic syndrome.". Genomics. 93 (3): 221–6. doi:10.1016/j.ygeno.2008.11.001. PMID 19056482. Ma GC, Liu CS, Chang SP, et al. (2008). "A recurrent ITGA9 missense mutation in human fetuses with severe chylothorax: possible correlation with poor response to fetal therapy.". Prenat. Diagn. 28 (11): 1057–63. doi:10.1002/pd.2130. PMID 18973153. Yerges LM, Klei L, Cauley JA, et al. (2009). "High-density association study of 383 candidate genes for volumetric BMD at the femoral neck and lumbar spine among older men.". J. Bone Miner. Res. 24 (12): 2039–49. doi:10.1359/jbmr.090524. PMC 2791518 . PMID 19453261. Lu Y, Dollé ME, Imholz S, et al. (2008). "Multiple genetic variants along candidate pathways influence plasma high-density lipoprotein cholesterol concentrations.". J. Lipid Res. 49 (12): 2582–9. doi:10.1194/jlr.M800232-JLR200. PMID 18660489.
van Steensel MA, Damstra RJ, Heitink MV, et al. (2009). "Novel missense mutations in the FOXC2 gene alter transcriptional activity.". Hum. Mutat. 30 (12): E1002–9. doi:10.1002/humu.21127. PMID 19760751. Pappa KI, Gazouli M, Economou K, et al. (2010). "Gestational diabetes mellitus shares polymorphisms of genes associated with insulin resistance and type 2 diabetes in the Greek population.". Gynecological Endocrinology. 27 (4): HASH(0x28c7db0). doi:10.3109/09513590.2010.490609. PMID 20540670. Joslyn G, Ravindranathan A, Brush G, et al. (2010). "Human variation in alcohol response is influenced by variation in neuronal signaling genes". Alcohol. Clin. Exp. Res. 34 (5): 800–12. doi:10.1111/j.1530-0277.2010.01152.x. PMID 20201926. Fabretto A, Shardlow A, Faletra F, et al. (2010). "A case of lymphedema-distichiasis syndrome carrying a new de novo frameshift FOXC2 mutation". Ophthalmic Genet. 31 (2): 98–100. doi:10.3109/13816811003620517. PMID 20450314. Ghalamkarpour A, Debauche C, Haan E, et al. (2009). "Sporadic in utero generalized edema caused by mutations in the lymphangiogenic genes VEGFR3 and FOXC2". J. Pediatr. 155 (1): 90–3. doi:10.1016/j.jpeds.2009.02.023. PMID 19394045. Silander K, Alanne M, Kristiansson K, et al. (2008). Janssens AC, ed. "Gender differences in genetic risk profiles for cardiovascular disease". PLoS ONE. 3 (10): e3615. doi:10.1371/journal.pone.0003615. PMC 2574036 . PMID 18974842. Dellinger MT, Thome K, Bernas MJ, et al. (2008). "Novel FOXC2 missense mutation identified in patient with lymphedema-distichiasis syndrome and review". Lymphology. 41 (3): 98–102. PMID 19013876. Corpeleijn E, Petersen L, Holst C, et al. (2010). "Obesity-related polymorphisms and their associations with the ability to regulate fat oxidation in obese Europeans: the NUGENOB study". Obesity (Silver Spring). 18 (7): 1369–77. doi:10.1038/oby.2009.377. PMID 19876004. Horra A, Salazar J, Ferré R, et al. (2009). "Prox-1 and FOXC2 gene expression in adipose tissue: A potential contributory role of the lymphatic system to familial combined hyperlipidaemia". Atherosclerosis. 206 (2): 343–5. doi:10.1016/j.atherosclerosis.2009.02.026. PMID 19339011.